A big splash for a new swimming pool in downtown Des Moines. 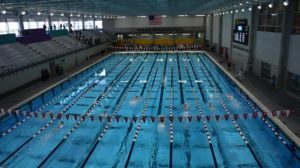 Officials with the Wellmark YMCA announced Monday that the TYR Pro Swim Series is coming to the MidAmerican Energy Aquatic Center March 6-9. Olympic Gold Medal winning swimmer Kathleen Baker, the world record holder in the women’s 100 meter back stroke, took part in the announcement. She expects the event will attract around 400 of the world’s top swimmers to Iowa’s capital city. The Olympic-sized pool at the Wellmark YMCA in downtown Des Moines opened in March of last year.